Published on 4 May 2012. I was at St James’ Park today for a mock exam. Luckily, it didn’t involve any demonstration of footballing skill, otherwise it might have gone rather less well for me. 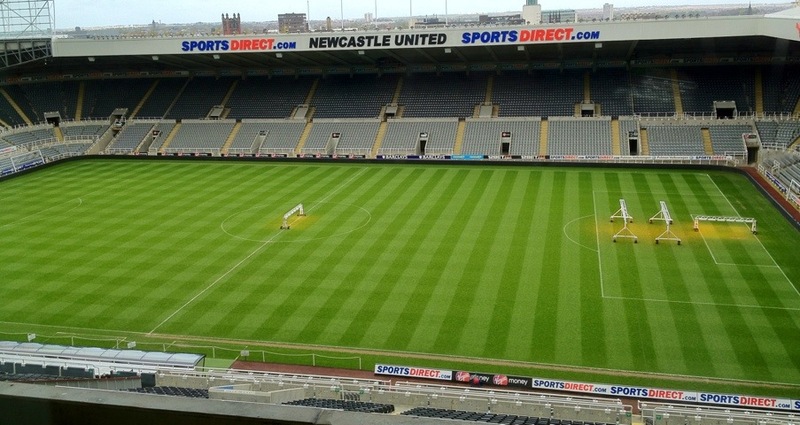 St James’ Park is, of course, the 52,000 seater home to Newcastle United, now officially called the Sports Direct Arena. Whilst that name is undoubtedly controversial, the old one is more controversial than many people realise. While the stadium’s official name was “St James’ Park” (with an oddly placed apostrophe), both of the local Geordie newspapers refer to it as “St James’s Park”. The nearby Metro station further muddies the waters, with the apostrophe-less name “St James”. And that’s before we even broach the debate about whether there should be a full stop after “St”! This 1,634th post was filed under: Photo-a-day 2012, Newcastle-upon-Tyne, Sport.